Many men who are incontinent or who use wheelchairs or who have limited mobility may have difficulty urinating in places that lack special facilities. Traditional products that are used to collect and transport urine, such as hospital bottles, are bulky and conspicuous. 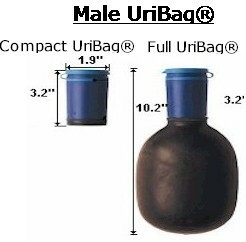 The UriBag® is a convenient solution. Its compact storage tube, efficient shape and Latex construction are superior to any existing product for men. In every detail, the UriBag® is an improvement for the user. Light and durable, the UriBag's snap-lock seal does not leak. It is easily stored and can be used, sealed, then emptied and washed with warm soapy water or a urinary appliance cleaner later. It requires only minimal privacy and may be used while either sitting or standing. An aid to personal freedom, The UriBag ® can be stored in a small place such as a glove compartment. For medical patients as well as a practical solution for traveling or camping, the UriBag ® is an ultramodern, discrete alternative. The UriBag can be stored in a very small space and is small enough (3.5 x 3.5 x 3.5) to be carried in a pocket - very discreet. The UriBag is imported from the Netherlands. Contains latex. Dispoable personal urination pouch.Each #1 Travel john contains an inner pouch of Liqsorb, a biodegradable polymer substance that immobilizes bacterial growth quickly, absorbs the liquid wastes and turns it into an odorless, contained spill-proof gel.